When you are a Microsoft user, it makes you the owner of all the functionalities it displays. Similar to the line is Windows Media Center, with this installed in your system you can stream up the media files stored in your Windows 7 or Windows 8 computer to a computer resting in another room of your house. Also the Windows Media Center does the things in a well managed manner for your set of systems. So with this media Center in your computer you can do ‘n’ number of things at the same moment. You might be wondering that why I have been mentioning Windows 8 right from the starting despite of the fact that Microsoft had promised to remove Windows media Center from the new Windows 8. But the amending constraint is still prevalent; you can download and install the Windows Media Center. So if you wish to install the Windows Media Center in your Windows 8 computer. So to make a start, go to the Metro Start screen or the App screen, as you wish to name it, then just surf around may be right to left or vice versa, unless you reach to the Charms Bar. Now the next step comes to click on the Search charm at the top of the bar. Now to enter into the entire scenario you need to enter the term “add features” in the search box. After this select the Settings category under the search box and then click the option for “Add features to Windows 8” from the search results so that you land into it. Once you have clicked on it, you need to enter this key: MBFBV-W3DP2-2MVKN-PJCQD-KKTF7. After the key is accepted, click next. After entering the key, accept the license terms on the next screen and then click Add features. Your efforts come to an end; now your Windows will install Media Centeritself and then reboot your PC. And now when the process of rebooting has ended you can easily find the tile for Media Center appear on the Start screen. After this just click on it, and then Windows will make a long-jump to the Desktop, so that it starts the Media Center that many Windows users know and love. 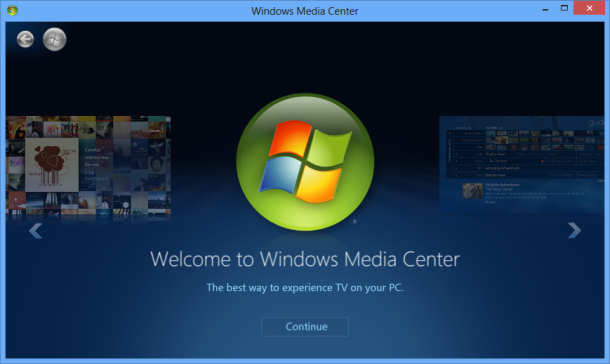 So, finally you have got your very own, Windows Media Center on your Windows 8 computer screen. About the Author: This post is sponsored by Danis Jonas of mytechgurus, which will provide full online remote computer support without packing it up and taking it to a store. Our mytechgurus skilled technicians provide solutions for all computer and network issues.